Just like in any relationship, the rapport you have with each of your supporters hinges on a series of touch points. The key to successful donor relationships is to strike the right balance of engagement. While email is only one component of your supporters’ overall experience with your fundraising campaigns, it’s the primary way they expect to receive communications from your organization. This post outlines three email types that will help you strengthen a supporter’s connection to your cause. Transactional emails are sent automatically as a result of a supporter’s specific action. These emails serve as simple gestures to demonstrate that the donor’s activity, however small, is appreciated. Examples of this type of email message include donation receipts, recurring donation notices, chargebacks, and eCards. In addition to sending specific messages to supporters and fundraisers, you can also set up notifications for key campaign stakeholders. 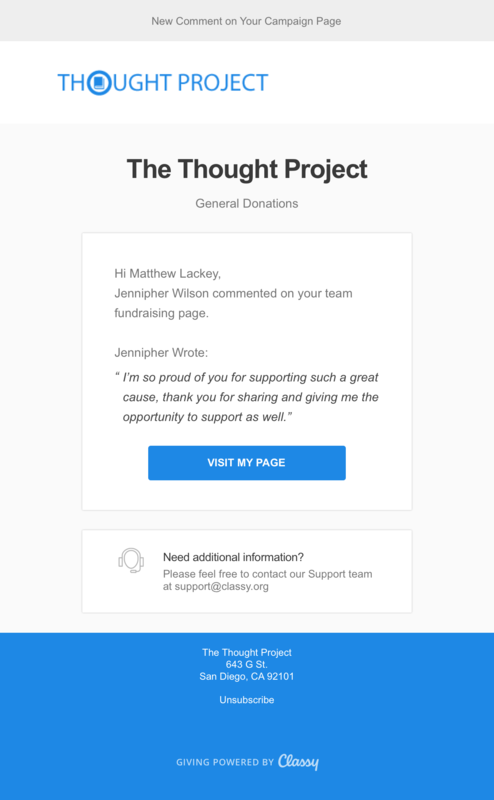 This example updates a fundraiser when a comment is made to their campaign page. This type of email is triggered whenever an update is made to the campaign or a comment is made on activity. This messaging keeps all admins in the know about key information regarding the overall campaign. 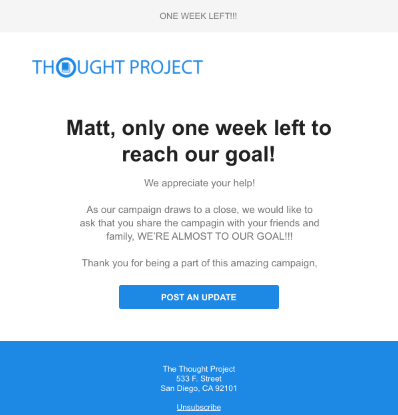 In this email, an admin at The Thought Project is notified when Matthew creates his fundraising page. Your organization is probably very familiar with campaign emails, which include blasts to large lists of supporters. Give an update on your campaign’s progress, or make a mass appeal to support your campaign. Create a sense of urgency by updating your supporters when time is running out. Nonprofits use email to incite action among supporters, which makes targeted messaging all the more important. When you segment your supporters, you acknowledge their history with your organization. This approach is much more likely to resonate with them and encourage the action you’d like them to take next. With Classy, you can easily segment your peer-to-peer campaign supporters into donors, fundraisers, or team captains. When it comes to peer-to-peer fundraising, email is the primary tool used to keep fundraisers in the know about their campaigns. Automated emails about their latest activity empower them to more effectively engage their network and raise more money, while saving your organization time and effort. Percent-to-goal messages to let fundraisers know when they’ve reached a certain amount of their goal. This will motivate them to work towards the next milestone. Dollar-amount milestone emails to acknowledge success and congratulate fundraisers when they’ve qualified for a specific perk. 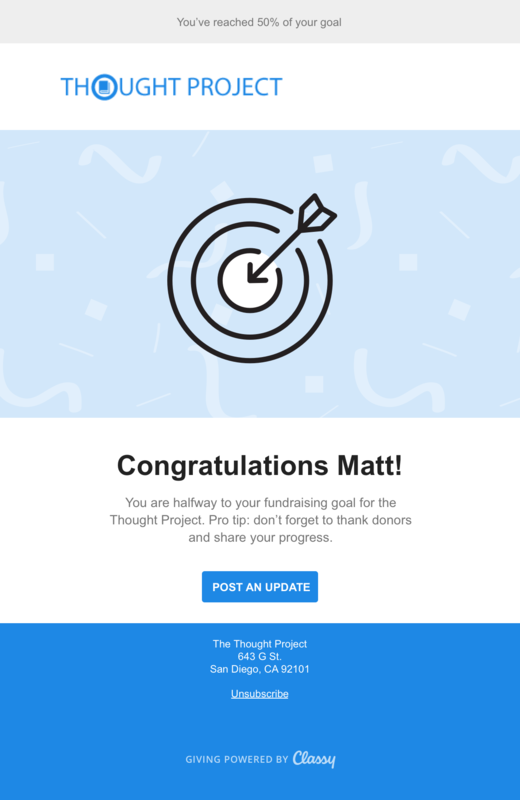 Milestone emails help to motivate your fundraisers as they approach their goal. These email types all serve one purpose: relationship-building. Each strategic message has the power to strengthen individual connections to your cause. It’s time to leave impersonal one-size-fits-all communications in the dust and send informed and genuine messages that activate.